Electric motors on vulnerable deck areas may be protected against ingress of water by being totally enclosed in a watertight casing. Vents are provided on some winches, which must be opened when the motor is operating in port. The direct current (d.c.) motor, although it is relatively costly and requires regular brush gear maintenance, is still used for deck machinery because it has a full speed range with good torque at any speed. The control of d.c. motors by contactor-switched armature resistances, common in the days when ships' electrical supplies were d.c., has long been replaced by a variety of Ward-Leonard type systems which give a better, more positive regulation particularly for controlled lowering of loads. 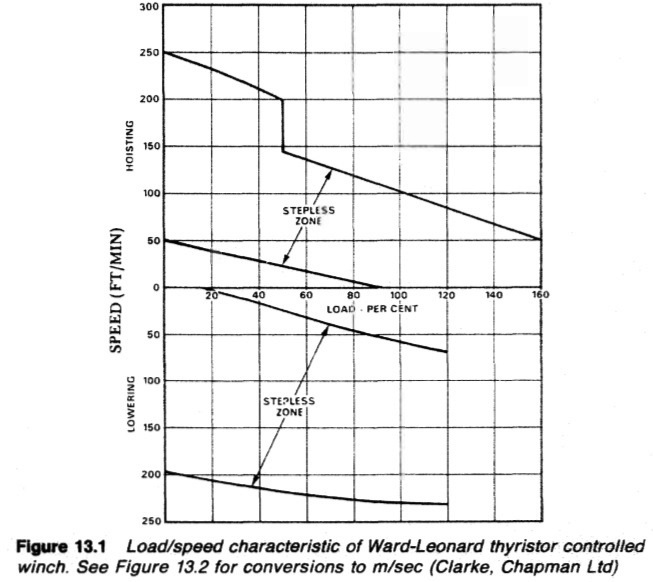 The Ward-Leonard generator is normally driven by an a.c. motor. An important feature of the d.c. drive is its efficiency, particularly in comparison with a.c. drives, when operating at speeds in the lower portion of the working range. The d.c. motor is the only electric drive at present in production which can be designed to operate in a stalled condition continuously against its full rate torque and this feature is used for automatic mooring winches of the 'live motor' type. The majority of d.c. winch motors develop full output at speeds of the order of 500 rev/min and where necessary are arranged to run up to two to four times this speed for light line duties. Windlass motors on the other hand do not normally operate with a run up in excess of 2 : 1 and usually have a full load working speed of the order of 1000 rev/min. Direct current motors may also be controlled by static thyristor converters which convert the a.c. supply into a variable d.c. voltage of the required magnitude for any required armature speed. These converters must be of a type capable of controlled rectification and inversion with bi-directional current flow if full control is to be obtained (Figure 13.1). Alternating current induction motors, of either the wound rotor or of the cage type are also in common use. With these the speed may be changed by means of pole changing connections and in the case of the wound rotor induction motor, also by changing the value of the outside resistance connected in the rotor circuit. The pole change method involves the switching of high currents at medium voltage in several lines simultaneously, requiring the use of multi-pole contactors. The pole change speed control method offers a choice of perhaps three discrete speeds such as 0.65, 0.325 and 0.1025 m/s corresponding to 4, 8 and 24 pole operation. The wound rotor motor is flexible when hoisting a load, because the starting resistances can be reintroduced into the rotor circuit and the load will cause the motor to slip. The slip gives a range between the speeds dictated by the pole arrangement. As with resistance controlled d.c. motors, difficulty is experienced when providing speed control of an overhauling load, i.e. lowering a suspended load. The disadvantages must be balanced against lower cost, particularly of the cage type induction motor, in comparison with the more flexible d.c. motor. 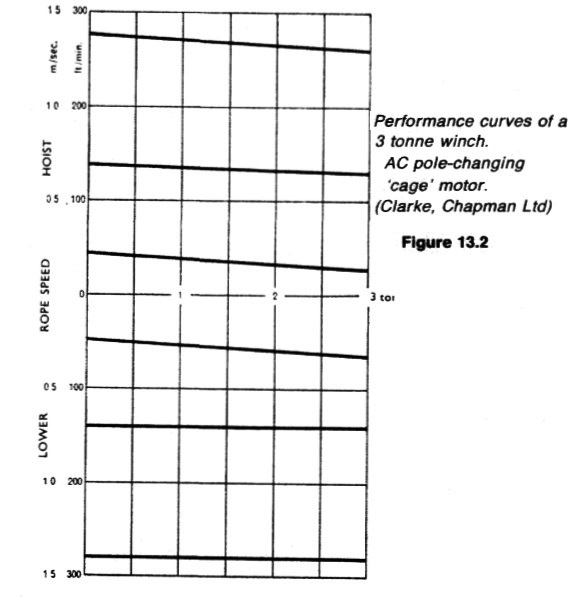 Typical performance curves are shown in Figure 13.2. Another form of induction motor control system is based on the relationship between output torque and applied voltage, the torque being proportional to the voltage squared. The controller takes the form of a three-phase series regulator with an arm in each supply line to the motor. A stable drive system can only be achieved by this means if a closed loop servo control system is used in conjunction with a very fast acting regulator which automatically adjusts the output torque to suit the load demand at the set speed. Control of an overhauling load is made possible by using injection braking techniques. A combined system employing both these control principles can provide full control requirements for all deck machinery. The a.c. drives described operate at the supply frequency and consequently rapid heating of the motor will occur if the drive is stalled when energized. The majority of a.c. motors on deck machinery run at a maximum speed corresponding to the 4 pole synchronous speed of 1800 rev/min on a 60 Hz supply. These speeds are similar to the maximum speeds used with d.c. drives and the bearings and shaft details tend to be much the same. The motor bearings are normally grease lubricated. However, where the motor is flange mounted on an oil bath gearcase, the driving end bearing is open to the gearcase oil and grease lubrication is not required.